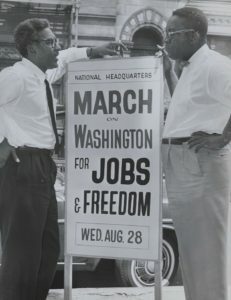 Organizing and managing logistics for the 1963 March on Washington for Jobs and Freedom was a massive undertaking. While most people are familiar with the March and Dr. King’s famous speech, little is known about the man behind the scene, the man responsible for coordinating the March and ensuring that all the parts came together for a successful, meaningful and impactful event. That person was Bayard Rustin, who has been described by one historian as the “lost prophet” of the civil rights movement. Rustin was a civil rights activist and he was gay. He worked mostly behind the scene to keep his sexual orientation from becoming an issue with critics. He was born in West Chester, Pennsylvania on March 17, 1912 and was raised by grandparents who were pacifists. He attended historically black Wilberforce University in Ohio, and Cheney University in Pennsylvania before moving to New York City in 1937 and enrolling in City College of New York. Rustin had a great singing voice, and while in school, supported himself singing with African American folk artists in clubs in the city. In 1941 he joined the Fellowship of Reconciliation (FOR), a pacifist organization formed by a group of Christians who were against using violence to solve international problems. Being a pacifist, Rustin was against war and in 1942 was jailed for refusing to serve in the military. He spent three years in Lewisburg Penitentiary as a conscientious objector. 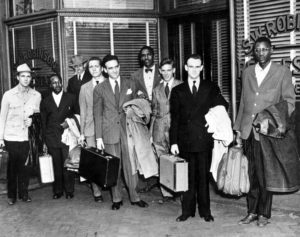 When released from prison he became active with FOR again and in 1947 led a group of blacks and whites on what was called the ‘Journey of Reconciliation’ to challenge racial segregation on inter-state buses. This journey was really the first Freedom Ride. Rustin was an advisor to Dr. King and helped organize the Montgomery Bus Boycott, and when A. Philip Randolph needed someone to organize the 1963 March on Washington for Jobs and Freedom he thought of the one person who had the skills and ability to bring it all together, Bayard Rustin. Rustin was a brilliant tactician, strategist and expert organizer. He died in 1987 and in 2013 was posthumously awarded the Medal of Freedom.